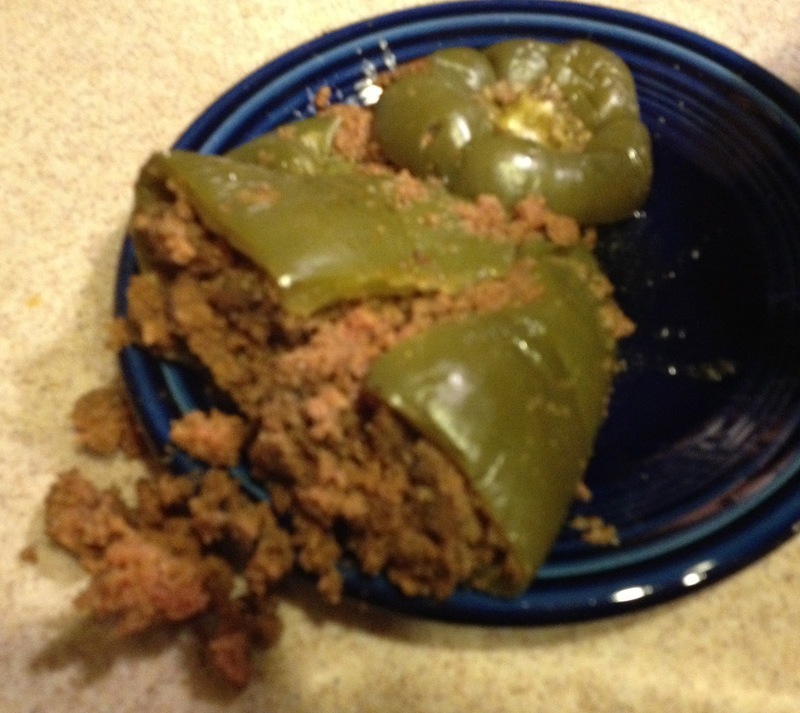 I had quite a few green peppers that I needed to use up, so naturally I thought of stuffed peppers. 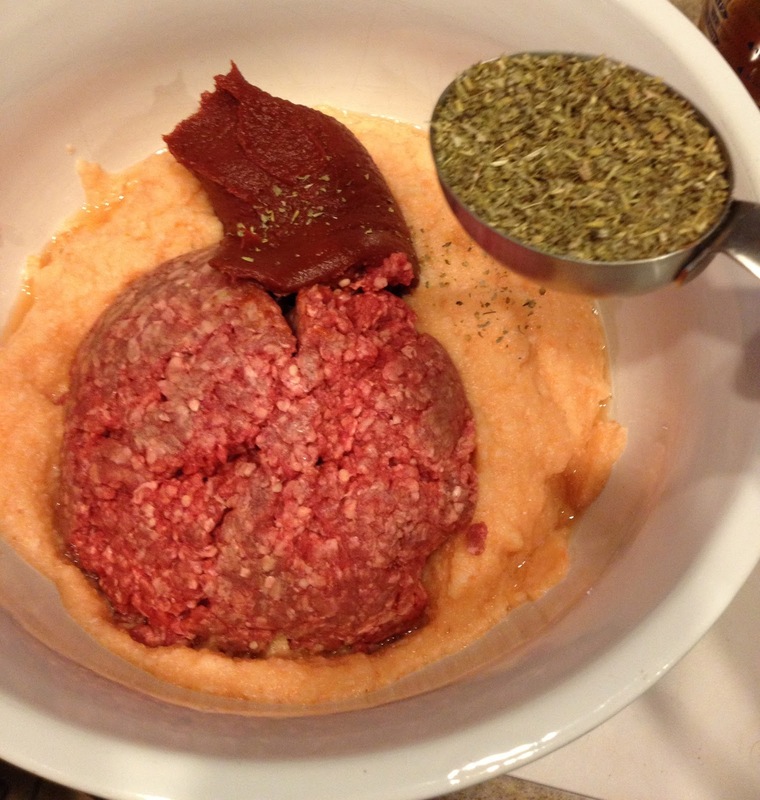 I decided to give this recipe from Civilized Caveman Cooking Creations a try. First, I gathered my ingredients. He used a beef/turkey mix, but I used beef only. In the first step, the recipe has you process the cauliflower, onion, carrots and garlic in the food processor. I peeled my carrots, cored my cauliflower, and roughly chopped up all these ingredients before putting them in the large bowl of my full sized food processor. The next instruction is to process these vegetables until "as fine as possible." This actually took a fair amount of time to get these vegetables "finely" processed. I started out pulsing as instructed, but then just left the machine on as it didn't appear any good progress was being made. I opened up the processor and mixed things around a few times. This took much longer than I expected. If I were to make this again with the food processor, I'd likely cut my veggies down even more before processing. The ingredient list gives some items "cutting" instructions, but I took those to be used if you weren't using a food processor. I then washed my peppers, carefully cut off their tops, and removed their seeds and spines. I had to rinse a few with water to get some seeds out. I poured my processed vegetables into a large bowl. I'm not certain that this is the "fine" the recipe really meant. It had the look of fluffy orange sherbet. This was no sherbet, mind you, the onion in it made my eyes water. I added the remaining ingredients to the bowl, put on a glove and mixed everything up with my hand. I did not use a homemade Italian seasoning blend, but store bought one that has worked well in other recipes. As I mixed, I felt better about the processed vegetables. I found one piece of unprocessed cauliflower while mixing and I discarded it. 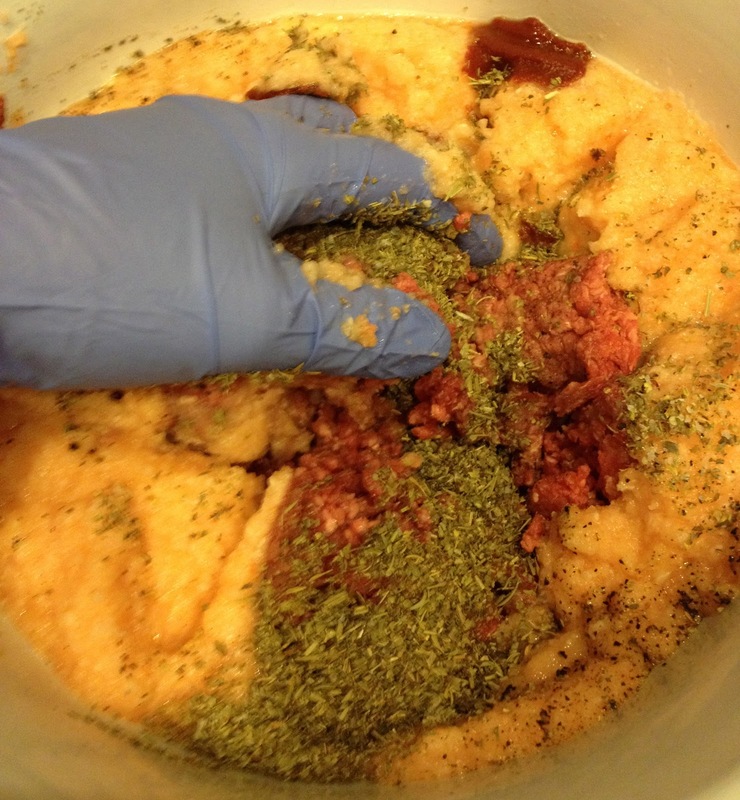 Once everything was mixed together, it looked like a stuffing should. 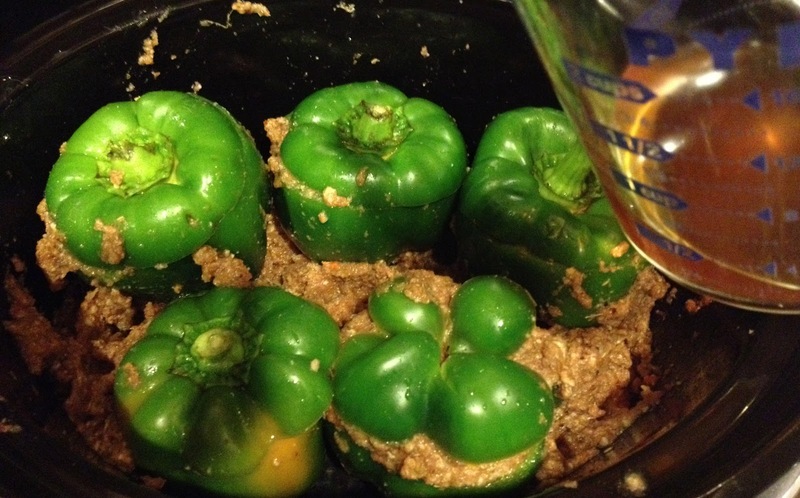 I filled each of my peppers and placed them into my slow cooker crock. I had 5 peppers to use and my 6 quart oval crock was able to fit them all. I had left over filling once I had filled all of my peppers. The recipe doesn't say what to do with this but it appears from the recipe picture that he stuffs the extra meat around the peppers in the crock, so that's what I did. I added some homemade beef broth to the crock, put the lid on and set the cooker on low for 8 hours. When the timer went off, here is what I had. There was a lot of liquid in there and the peppers were quite delicate. I carefully lifted one of the peppers out with tongs, and well, it didn't make it to my plate entirely as it fell apart mid-lift. 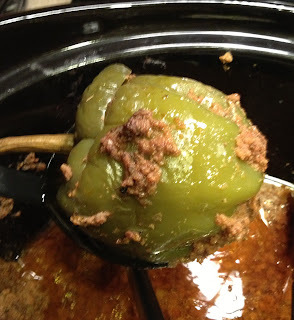 I used tongs and a ladle for extra support to remove the remaining peppers from the crock. 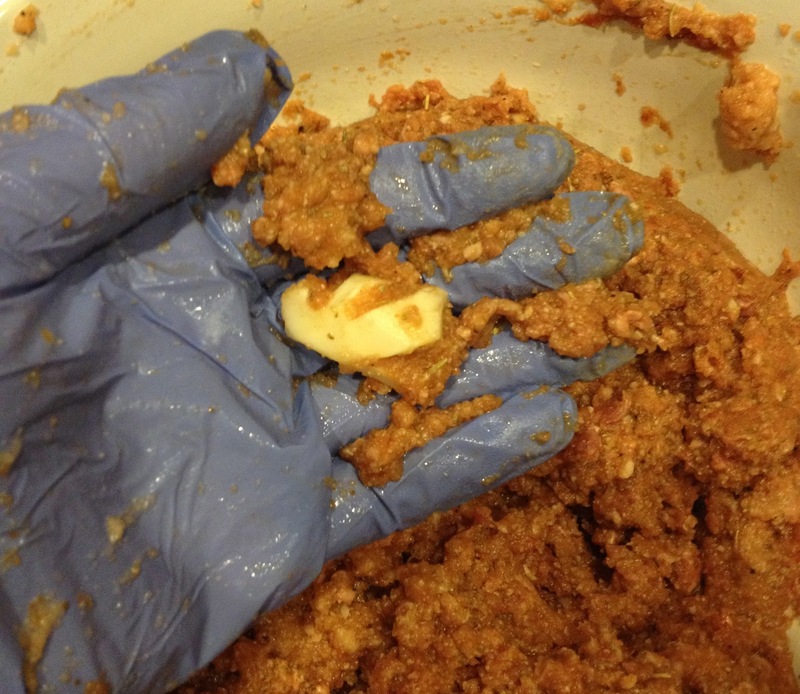 What was left was a mixture of the extra stuffing and cooking liquid. 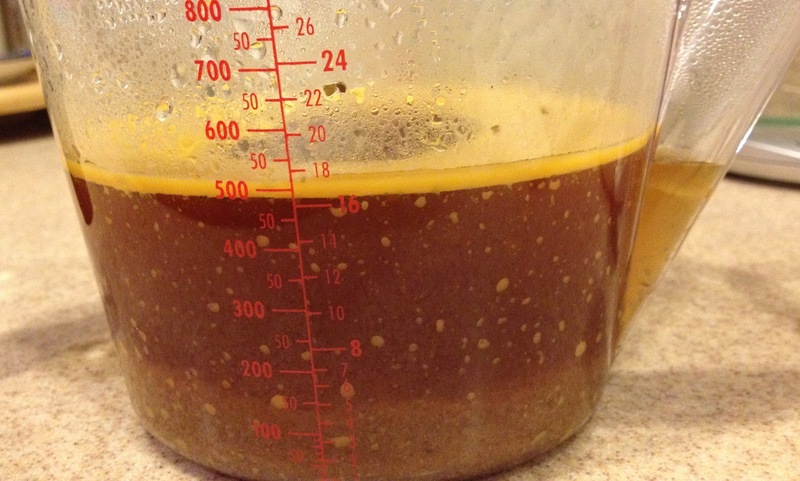 I used my fat separating measuring cup to strain out the meat from the liquid. The peppers released more liquid into the storage container I used. There wasn't that much fat in the liquid. Accessibility & Cost of Ingredients: You should be able to find everything you need for this recipe at your "big box" grocery store. You may have to go elsewhere to find grass fed beef if that's what you choose to use. I'm still going through my freezer stash of Whole Foods grass fed ground beef from the $4.99/pound sale they had months ago. Preparation and Cooking Time: The recipe claims a 10 minute preparation time. My prep time from start until turning on the slow cooker was just under 30 minutes. The processing until "as fine as possible" really took a while. 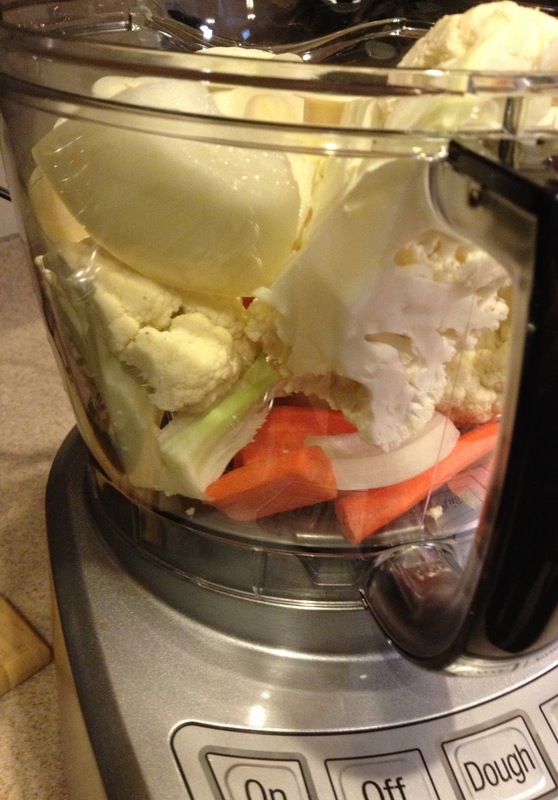 He notes that you can chop your vegetables "as small as possible" if you don't have a food processor and I think it might have been quicker for me to to it this way. If I make this again, I'll either pre-chop my veggies more before processing or just hand chop them all. 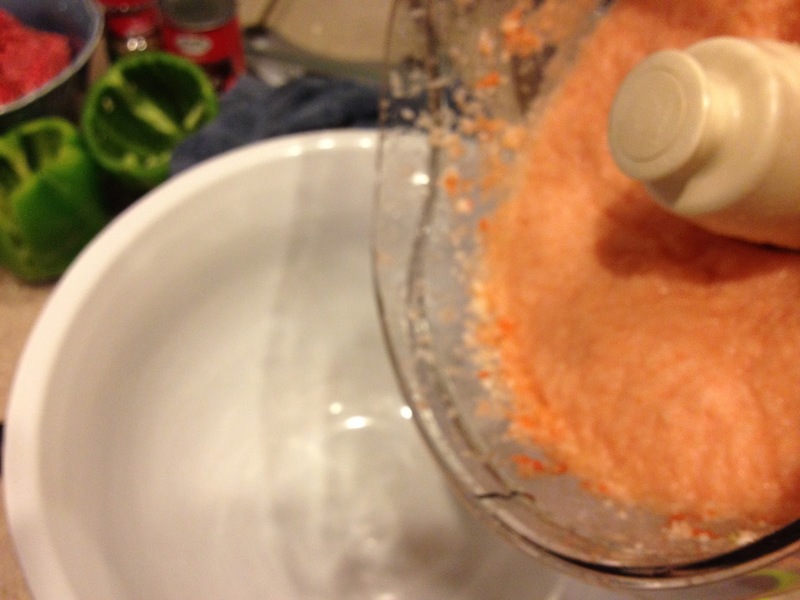 Perhaps I over estimated the power of my food processor , but its pretty powerful. I've decided I like descriptor "fine" by itself when it comes to processing vegetables. The cooking time was 8 hours. The range given is 6-8 hours. I decided on 8 because I usually err on the side of a longer cook time for slow cooker recipes. Also, if I were making this on a work day, it would likely be in the slow cooker for 11 hours or more (6-8 on low and then "keep warm"), so I wanted to give it a fair test for how it would typically work out in my kitchen, if I didn't make it overnight or on the weekend. Clean up: The clean up was pretty easy and I put everything into the dish washer. Be careful when taking these peppers out of the slow cooker as it could become really messy as they will fall apart. The Paleo Review: 1/18 Update: Meh to Thumbs Down. 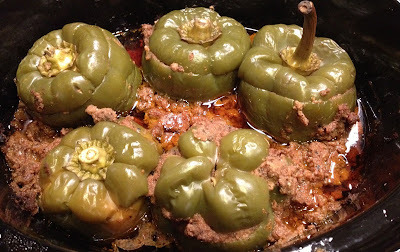 These stuffed peppers were really quite different from any that I've had before. I've not quite decided if I like the difference or not, but the more I stare at the leftovers I froze and think about having to eat them, the more I'm leaning towards not. First, the use of the veggie puree in the stuffing makes the stuffing much less dense than the stuffings I've tasted in stuffed peppers before. The texture is very light. This isn't necessarily a bad thing, but I would like a little more meaty bite in there. It also takes away from the peppers having meaty flavor. I don't think using a mix of beef and turkey would make a huge difference in taste because ground turkey has a pretty bland taste. My experience with stuffed peppers has always included a fair amount of tomato. This recipe did have tomato paste in it, and I didn't forget to add it, but I just couldn't taste it really. The peppers were really quite bland in taste/flavor for me generally. I did season with salt and pepper, but I guess not enough. The next day, I put some tomato sauce on one of them and the flavor was improved, but I still wasn't cleaning my plate. 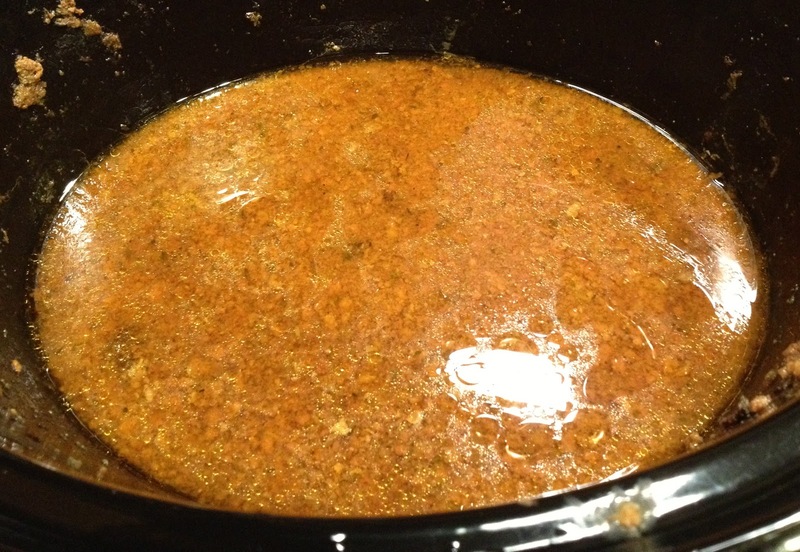 The peppers were quite mushy, so I'd recommend checking the slow cooker at 6 hours or less to see if they were done rather than letting them cook for a full 8 hours. If I were to make this again, I likely would not use the food processor. I would chop up the veggies into a small dice by hand, but certainly not as small as possible. I think this might allow some of the flavors of both the beef and veggies to come through. I'm going to try to freeze them. After a night in the refrigerator, they were easier to handle in that they didn't fall apart as easily. I don't have room in my refrigerator to put an entire slow cooker crock in there for the sake of keeping peppers from falling apart though. I'll update the post with whether or not the freeze well if I ever get around to eating them. 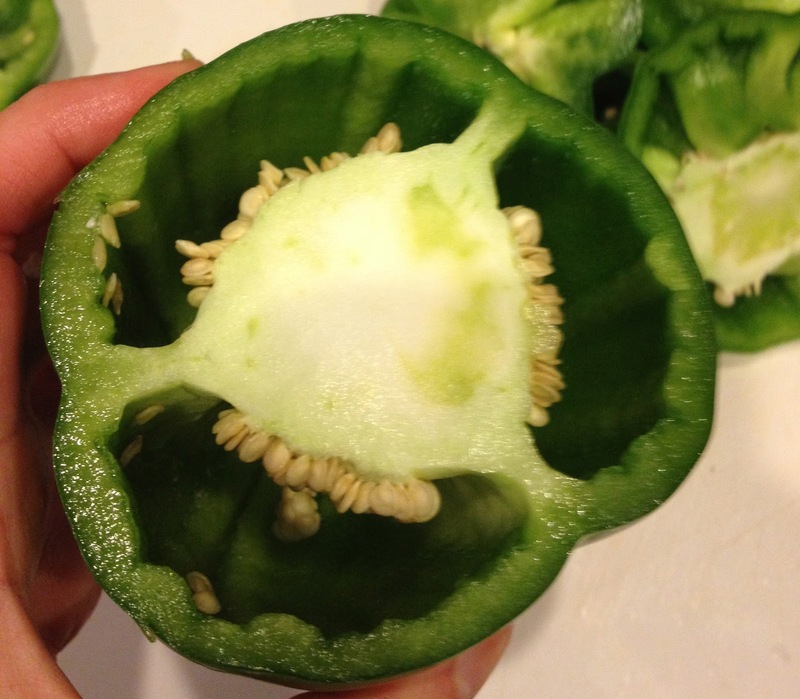 So, if you're looking for a lighter stuffed pepper, this may be your recipe. 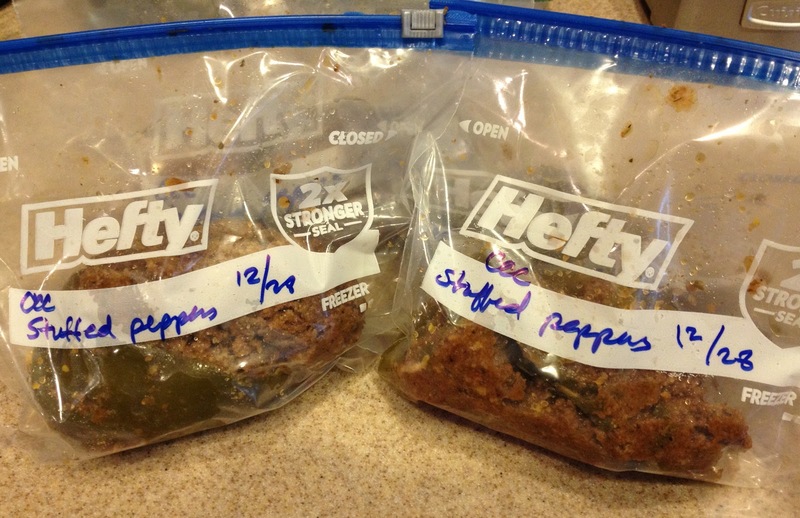 Do you have a favorite stuffed pepper recipe to recommend? 1/18 Update: After basically forcing myself to choke down 2 of the peppers that I froze, I'm changing my review to just thumbs down. 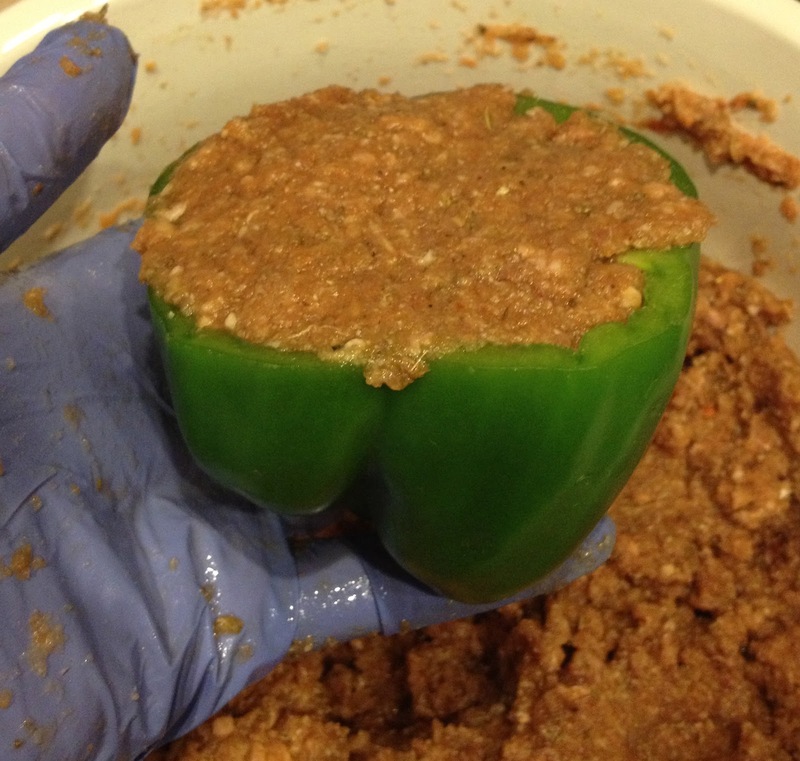 Once reheated, the peppers and filling pretty much turn into tasteless runny mush. I have been putting quite a bit of mustard on them to try to give them some taste. I don't like eating things I don't like, so the remaining frozen portions of this recipe will be going into the garbage. Post Script: The next day, I made the Fire Roasted Meatloaf from Paleo Slow Cooking: Gluten Free Recipes Made Simple . 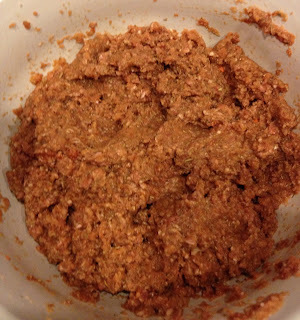 It also uses the food processor for chopping vegetables to combine with the ground meat and I had a much different result. I'll be posting my review of that recipe on Friday.